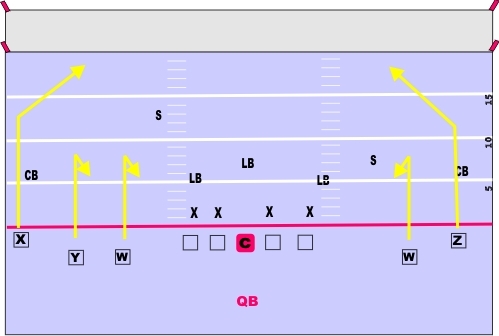 This is your basic spread option five WR set. Your two outside WRs run 9 routes and the 3 inside guys run 6 routes. The QB will have plenty of options to choose from. Regardless of the defense being played, this play will overwhelm the secondary. They just won’t have enough guys to cover everyone. 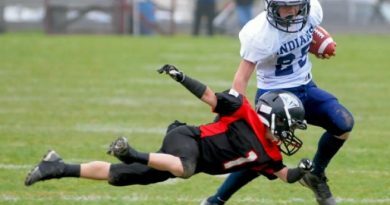 Make sure your QB is good at throwing and make sure he gets it to your most athletic WR, the rest are distractors. If the safeties stay high, get it to one of the underneath 6 routes. If the safeties clamp down fire it off to one of the outside 9 routes deep.